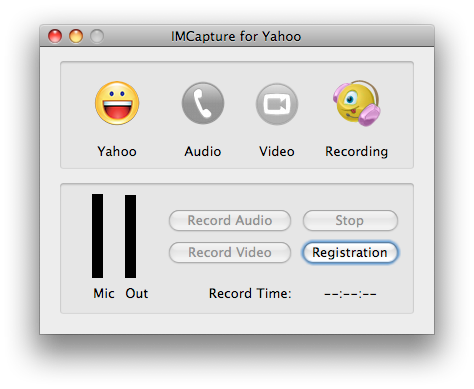 IMCapture for Yahoo is designed to capture and record audio and video calls made from Yahoo messenger for Mac OS X. It saves recorded files as MP3, WMA or AAC files and Quicktime Movies (MOV), MPEG4, MPEG, VOB, PSP MPEG4, SWF and FLV, AVI. Would you like to have an opportunity to keep in memory every precious moment of communicating with your relatives and friends? From this very moment the newly created program IMCapture for Yahoo! Messenger is at your service. This tool allows to keep good memories of all conversations both voice and video, so you will always be able to enjoy them again and again any time. It allows you to save all messages typed so you may follow the chat history whenever you want. Download a free trial version today. IMCapture for Yahoo! Messenger is worked out for people (especially users of Yahoo IM services) who want to record every second of being in touch with their friends and colleagues even if they are miles apart. Use the function of our program that enables other users to connect to your web-camera and communicate with several friends at the same time. Businessmen may find it especially attractive to organize business conferences without leaving their house. This program is designed to capture and monitor audio and video calls and save them converted as MP3, WMA or AAC files and Quicktime Movies (MOV), MPEG4, MPEG, VOB, PSP MPEG4, SWF and FLV, and to AVI (Windows version) correspondingly. Thus the owners of the IMCapture are able to take advantage of both significant business conversations and memorable family talks being recorded. Now all calls can be replayed, shared or studied at your will. What is more, this tool also makes it possible to adjust the quality of the video manually so you will be never disappointed with the quality of the video saved. IMCapture for Yahoo! Messenger is an irreplaceable tool for those who appreciate every moment spent with people who are dear to them. To become one of the happy IMCapture for Yahoo owners all you need is to install the program following simple instructions. Try IMCapture for Yahoo! Messenger today to discover opportunities of this program!